Everyone has been there..you walked into a hair salon blindly because it was close to your home or you drove by it and thought it looked good. Then the worst happens–you walk out with a terrible experience and you’re unhappy with the way you look. The hair salon you choose to visit has a significant impact…not just on the way you look ,, but ultimately feel about yourself. With the explosion of the internet, and the advent of social media and online reviews, choosing the right hair salon or hair stylist isn’t as hard as it used to be. Whatever your reason to find a new hair stylist, whether it be that you are new to the Springfield Oregon area or you just got fed up with your old hair salon, here are a few tips to choosing your next great hair salon! Go online and take a look at what people are saying about hair salons in your area. People like to talk about a great experience with their hair stylist and for every one positive review you can bet there were many others that felt the same way. When people love their hairdresser, they will talk about them on the social media pages like Facebook and Twitter. We encourage you to look at our reviews on Yelp or Google and we encourage you to write your own about us. Hair Salon owners who are smart are going to keep their website updated and accurate. 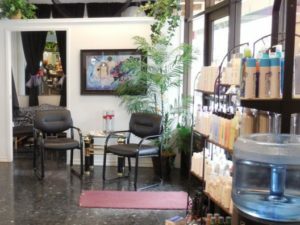 You should be able to see what type of salon environment you are walking into to make a good decision. Look for a gallery page where you can view pictures. Do they have a “Meet the Team” page? Is it accurate? If a hair salon owner doesn’t take the time to keep her staff updated on the site what else are they not doing correctly? Look for a stylist that specializes in the look you are going for and make sure you choose one with the credentials and experience you are looking for. Can you book an appointment online? This will save you a lot of time down the road and takes the hassle out of waiting on the phone. Look for pricing information as well to make sure you find a salon that fits your budget and you might also want to think about choosing a hair salon that offers more services than just hair. Doing a little online research is a great starting point for choosing the right hair stylist for your next visit. A staff member should answer the phone with a friendly tone and greet you with a “Good Morning/Afternoon thank you for calling SALON NAME HERE”. The staff should sound and be helpful and friendly without using slang words or sounding put-out by your call. 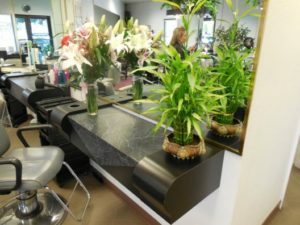 A visit to a Hair Salon in Springfield Oregon should be an engaging and fun experience and you shouldn’t have to wait until after you actually arrive. The hair salon should be clean and tidy. As soon as you walk in, the receptionist should greet you and make you feel welcomed. The staff and the hair stylist should be respectful and smart. They should meet your standard of professionalism, be friendly and nice to talk to. Ask them about their backgrounds and experience. Ask who the best stylist is or who is the best colorist. Take a quick look around and look at the prices and the product. Are the products on the shelves in order, clean and tidy? Finally take a look at the hair stylist themselves, they should look the way you want to look and be put together and professional. We hope these tips for choosing the right salon and hair stylist in Springfield, Oregon has helped you to make a good decision. We hope you will come into Sunflower Salon and give us a try, as we strive every day to do the things we talked about here. For more information or any questions please give us a call or send us an email through our contact page.